Rocky Landscapeis not an exhibition one visits in the common sense of this word. There is no space here one would enter to see objects on display. There is no traditional explanatory curator‘s text. There is also no, frequent in galleries, physical distance between the audience/recipient and the work of art. What one does find here in turn, is a suitcase presented as a lost airport luggage. The artifacts it contains can be conveniently taken out and inspected, revealing the narrative on their mysterious owner who spent holidays on the Ruhnu Island, Estonia. This extraordinary island is located in the Baltic Sea in the Gulf of Riga and has barely 60 inhabitants. It takes three hours by ferry, which runs only three times a week (in the winter the sole means of transport is a light plane), to get onshore. Its isolation determines its special atmosphere and flora both of which decided on choosing the island as journey destination by an international group of artists in 2016. Their stay referenced the idea of an artistic plein-air, during which artistic activity springs naturally from the mundane. Majority of the artefacts gathered in the suitcase are the products of this energy. 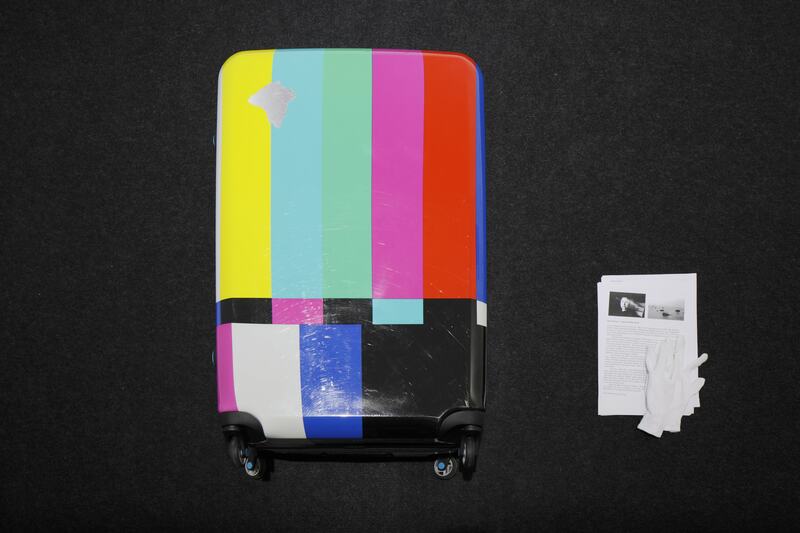 The objects from the suitcase, however, are not just means of documenting the actions taken on the island. One should rather describe them as a form of anti-documentation – recordings of a purposefully creative character, breaking with the monotony of traditional means of recording art. Anti-documentation is a game played on the artists-curators-audience axis, and poses a challenge for the common ideas around documentation. Oscillating between fiction and reality, the exhibition thus neither gives full information on the island itself, nor on what went on during the stay. By the same token, Ruhnu becomes a space of fantasy and projection, unconstrained by the discipline and order of facts. The title of the project – Rocky Landscape – references China Miéville’s short story (“I turned slowly around and gazed at each wall in turn. I took in the chaotic, intricate patterns of crumbling paint and damp plaster. They looked like maps, like a rocky landscape”); and manifests a continuing interest in narrativity, demivisibility and practices of withdrawal from the world of art so inscribed in the artistic agenda of the Bunkier Sztuki Gallery. The project certainly shows an affinity with another exhibition inspired by Miéville’s “Details” – “A Million Lines” (2015–2016) as well as a work by Jan Hoeft created for the Gallery’s collection (2015–2016) or the exhibition “Gestures of Disappearance” presenting the work of Arthur Cravan, Bas Jan Ader, Chris Burden and Lee Lozano (2015). 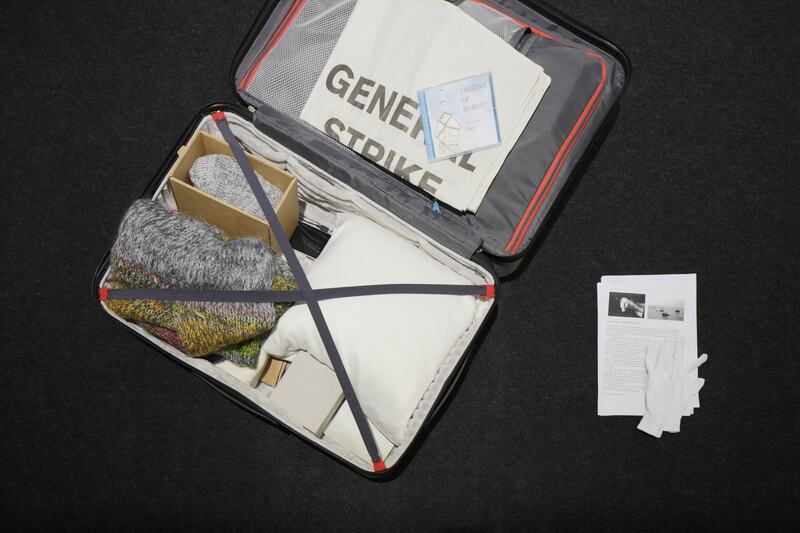 Design and production of the inside of the suitcase by Kinga Stanowska. Rocky Landscape was produced by and first displayed at Bunkier Sztuki Gallery of Contemporary Art in Krakow (October), then showed in Contemporary Art Centre (CAC) in Vilnius (November) as a spin-off of the 12th Baltic Triennale, whose main organizer is the Contemporary Art Centre (CAC) in Vilnius, with Virginija Januškevičiūtė as curator. Programmas “Polijas kultūras popularizēšana ārvalstīs 2016” ietvaros projektu atbalsta Polijas Kultūras un nacionālā mantojuma ministrija.